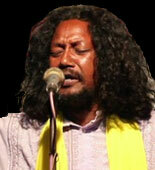 Wild-haired possessor of a powerful, bluesy voice, Golam Fakir of Jalangi is one of the most prominent fakiri singers of his generation. He received his tutelage in the Boirabori tariqa under his guru - the great Boyati singer and writer, the late Rashid Sarkar of Manikganj, Bangladesh. As one of the first Indian initiates into the tariqa and also influenced by other prominent contemporaries of Rashid like Mamtaz and Matal Rajjak, Golam brought the musical tradition of his guru`s durbar into Nadia-Murshidabad (and later, Kolkata) and popularised Rashid`s style of bicchedi singing.